As a part of Murray State College’s homecoming festivities, a groundbreaking was held for the new agriculture and science building. At the groundbreaking, MSC President Joy McDaniel spoke of the importance of constructing a building that will last and offer the kind of space needed for science and agriculture classes. She said as the need for STEM (science, technology, engineering, mathematics) jobs increases, MSC will be a center for training for those high-demand jobs. McDaniel says that it was important for MSC to focus the College’s resources to help support those needs of the State. The proposed building will add approximate 45,000 square feet of new classroom, lab, and meeting spaces to the campus. The ground level will house multiple teaching labs, classrooms, offices, and a two-hundred seat lecture hall. A 20,000 square feet upper level will house classrooms and state of the art lab spaces. Plans for the building also include some non-traditional class settings where students can collaborate with instructors in glassed in “think tanks.” The new building will be built on the south side of the campus and will include a small lake that will take in several gullies that currently exist on the land. The project was designed by Corner Greer and Associates, architects out of Ardmore, and will be built by construction manager RFD Construction of Sulphur. The new science and agriculture building is a part of the Murray State College master plan. As of now, the College is ahead of schedule on the plan. President McDaniel pointed out that at only three-years into the master plan, MSC is already starting on a project that was slated for the 10th year of the plan. 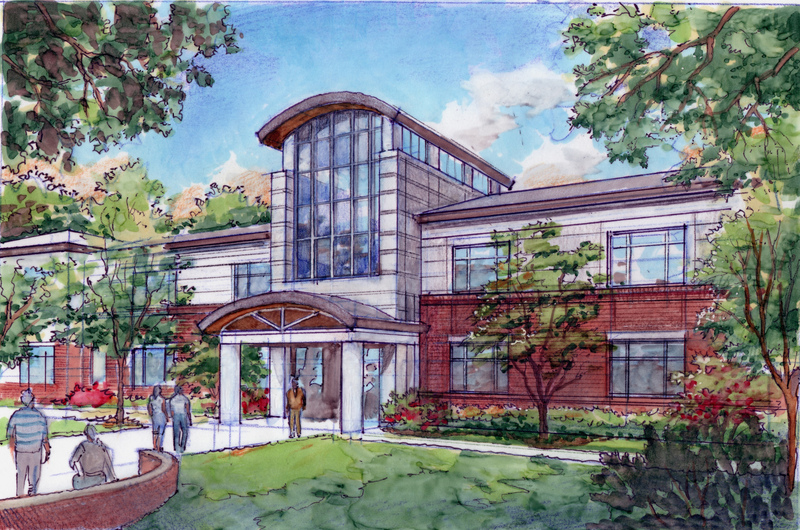 Construction on the building will begin in early spring of 2015. On hand for the groundbreaking for the new Murray State College agriculture and science building were: (l-r)MSC Foundation Director Brenda Stacy, Vice President for Student Affairs Michaelle Gray, Vice President for Institutional Effectiveness Becky Henthorn, Chair of Agriculture and Related Technologies Jody House, Assistant Vice President of Institutional Effectiveness Shawn Wakefield, MSC Board of Regents Chair Kay Helms, President Joy McDaniel, Regent Peggy Shaffer, Regent Frank Johnson, Vice President for Academic Affairs Roger Stacy, Chair of the Science Department Aaron Elmer, RFD Construction Contractor Larry Sloan, CGA Architect Doug Corner, Senator Frank Simpson, Executive Assistant to the President Malynda Cobb.On hand for the groundbreaking for the new Murray State College agriculture and science building were: (l-r)MSC Foundation Director Brenda Stacy, Vice President for Student Affairs Michaelle Gray, Vice President for Institutional Effectiveness Becky Henthorn, Chair of Agriculture and Related Technologies Jody House, Assistant Vice President of Institutional Effectiveness Shawn Wakefield, MSC Board of Regents Chair Kay Helms, President Joy McDaniel, Regent Peggy Shaffer, Regent Frank Johnson, Vice President for Academic Affairs Roger Stacy, Chair of the Science Department Aaron Elmer, RFD Construction Contractor Larry Sloan, CGA Architect Doug Corner, Senator Frank Simpson, Executive Assistant to the President Malynda Cobb.